Balance in all things is an ages-old recipe for fulfillment and happiness in life. 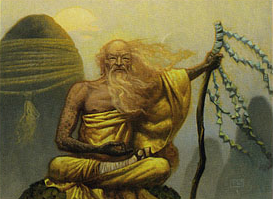 “Enjoy all things in moderation,” goes a common refrain, “except moderation.” It is thought that by finding the centre between the many forces pulling one’s self in different directions, one can find tranquility and harmony, that position of perfect equilibrium as refreshing to our spirit as a wooden beam precisely balanced upon our shoulders. Balance is also critical to the health and longevity of our shared passion, Magic: the Gathering. It speaks well to the balance of the game that we are still here discussing it nearly two decades later, but like our personal balance it is not a static condition. It is instead one that must continuously and deliberately be maintained. Witness the balance between the five colours, predictability and variance, power and toughness, risk and reward, cost and outcome. Balance is no mere window dressing, but rather it speaks to the very heart of any game that deals with forces in opposition. Ask anyone who engages in player-versus-player video games who has the easier time of it: Horde or Alliance? Chaos or Order? You’re likely to get some very spirited responses. Balance is one of many things that must be taken into account when designing a new Magic set, but it comes to the fore much more visibly when looking over those Magic releases which directly pit two decks against one another. While colours can be balanced over time (“Blue was strong last time, now Green gets its turn.“), Duel Decks are frozen in time forevermore once released. Indeed, the entire success of the product is predicated upon the degree which each side can be given as close to equal power as is possible. Players might still line up to buy Duel Decks: Planeswalkers vs. Thrulls, but not for the reasons the designers might hope. Today we’ll be taking a look at the concept of balance and how it applies to direct-opposition releases and what we might expect from the product line in the future. The first official Duel Decks release was launched on 16 November, 2007, but its spiritual ancestor trundled off the printing press nearly a decade earlier. 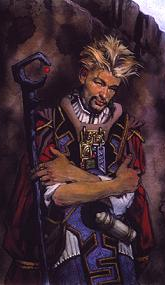 1998’s Anthologies was created in commemoration of the game’s five-year history, and like the later Duel Decks featured cards from all different sets ranging from Limited Edition Alpha to Urza’s Saga. There were two decks included, one Green/White and the other Black/Red. Although their colours and cards were completely different, there was one thing that the decks had in common. It takes a certain generosity of spirit to look kindly upon Anthologies. Yes, they were bad, but they were also Wizards’s first foray into a real self-contained preconstructed segment. Sure there was the Rivals set two years before, but that was designed as an introduction to the game and to get new players acquainted with the concepts behind it. You can hardly fault the developers for looking to begin on safer ground, and so they did: both decks are essentially a version of the same deck, but in their respective colours. Each deck gets two artifacts and has 23 creatures. Green/White gets an Order of the White Shield. Red/Black? A Knight of Stromgald. A Serra Angel on one side is offset by a Volcanic Dragon on the other. Green/White gets a White Knight. Red/Black? Take a [card Black Knight]wild guess[/card]. Indeed, the “playing it safe” mentality went beyond key cards into making both adhere to a narrow set of parameters. Because weenies are typically much less swingy tham bombs (and therefore produce more consistent outcomes that are easier to control), Green/White is packed with 1-2 power creatures, a sleep-inducing 78% of them. And Red/Black? Surprise! Also 78%. This was inarguably balance, but it was one imposed from the outside rather than one that found its inner peace and harmony through the offsetting of opposing forces. It would be back to the drawing boards for Wizards. Although the “two versions, one deck” model would never again so blatantly reappear, it would have a resonance that would echo years ahead. Thanks in part to the design strategy, however, these decks managed to capture enough of a distinctive feel that it avoided the trap Anthologies fell right into- generic duplication. Sure each side had its fatties, but they were well-chosen not only for size but how they mechanically represented their colour. Sengir Vampire? Very Black. Leviathan? Undeniably Blue. Contrast that with the opposing deck’s Shivan Dragon (firebreathing) and Force of Nature (massive trampling). Using the weenie metric employed above, we find that only 14% of Aerodoom’s critters have 2 power or less, with a slight uptick for Ground Pounder (20%) due to its need for mana-ramping elves. These may have followed a similar script, but in their execution they felt far more flavourful- cards selected with purpose, not just a set of nearly-identical throwtogethers. Wizards was learning. But alas, for whatever reason Beatdown was the end of the line. The following year’s specialty product, Deckmasters: Garfield vs Finkel, consisted of decks designed by those prominent personalities rather than by Wizards directly, and therefore outside the scope of consideration. It would be another seven years before the idea of the duel-in-a-box would again bear fruit when the Magic world awoke to the announcement that a new product, the Duel Decks, was launching amidst a horde of elves and goblins. Duel Decks: Elves vs Goblins was a flavourful home run from the start. Both tribes are ones that not only play well amongst their own kind, but are popular are even occasionally competitive at the highest levels of the game (at the time of writing, mono-Green Elves! has been sighted in Standard, and the Goblin-touting Red Deck Wins hasn’t really gone away). Make no mistake, Elves vs Goblins had some analogous card selections. However, on the whole the decks hewed true to their tribal flavours which, despite both being tribal reboots largely derived from Onslaught block, reinforced very seperate identities. It’s a bit like a Camry and a Lexus: their exteriors might be quite different from one another, but under the hood in each case you’ve got a Toyota. It was an encouraging next step. The next evolution in the Duel Decks came with the decision to base the decks upon their newest permanent type, which had been introduced just a year earlier in Lorwyn: the Planeswalker. Duel Decks: Jace vs Chandra was tremendously successful from this perspective as it gave the developers an easy theme to wrap a deck around. This “back to basics” thematic approach was one that would be repeated over and over again. [card Chandra Nalaar]Chandra’s[/card] a Red pyromancer and her deck will be aggressive Red critters and scads o’burn. Liliana Vess? Black graveyard and discard effects. [card Elspeth, Knight-Errant]Elspeth[/card]? White Soldiers. Without taking anything away from the designers, since this isn’t easy work, once you’ve selected the Planeswalker the deck virtually builds itself. You won’t go broke wagering that lifegain will be a solid theme in the White half of this Autumn’s Duel Decks: Ajani vs Nicol Bolas. The follow-up of the tribal Duel Decks with the Planeswalker one in 2008 cemented a release schedule that promises to continue into the future, namely that of the Autumn Planeswalker-based decks, and the Spring-based thematic ones. 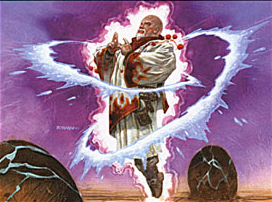 In April 2009, the second thematic Duel Decks launched, and the Magic world was given Duel Decks: Divine vs Demonic. Consisting of a monowhite deck filled with Angels versus a monoblack one stuffed with Demons and Imps, the deck looked every bit the descendant of the Anthologies–Beatdown-Elves/Goblins lineage. In the case of both of its decks, you had a series of relatively inconsequential bodies filling up space as each deck raced to get out its top-of-curve beaters aided by a smidgen of mana ramp (Dark Ritual, Marble Diamond). Although a novel concoction- neither Angels nor Demons had ever held a richly-defined tribal place in Magic’s lore- there was little innovation here. Beatdown could get away with its parallel trajectories a bit more because it was crafted a decade earlier. It would take revisiting a storied and epic period of time in that very lore to finally signal a sea change with the design of the decks. March 2010’s Duel Decks: Phyrexia vs. The Coalition was an intriguing choice of subject. Although many players of the game may not have been active during 2000’s Invasion block where the story originally concluded, most would recognise the Phyrexians as one of the game’s greatest villainous creations. Wizards certainly wanted to create a product worthy of the names, and while in the end they fell a bit short from a playability perspective, what they accomplished in terms of innovation for the Duel Decks series can only be accorded the highest praise. They finally broke free of the curse of trying to run parallel decks, and found true harmony by balancing wildly differing and adversarial forces. Certainly it was more than capable “live-the-dream” explosive starts like Swamp -> Dark Ritual -> Priest of Gix -> Phyrexian Negator, but just as often you’d be sitting around with a Puppet Strings, a Voltaic Key, a Hornet Cannon, and a sour look on your face. Phyrexian removal was also deliberately scaled back, with access to about half as much removal as Liliana’s own mono-Black construction. Still, balance was attained, and not the artificial balance based on homogeneity. This was a true and splendid thing: an equilibrium of unrelated forces in opposition. Signs for the future give good reason to be optimistic that Wizards has made a significant learning advance through their experience with the Duel Decks. They’ve matured and broken free from their legacy of parallel design, and the curse of the Anthologies can at last be said to have been broken. The next thematic set has already been announced as Duel Decks: Knights vs. Dragons. Cheap White weenies versus big Red beats? Now that would be harmony in opposition! “…It’s almost as if you were privy to a clutch of Phyrexian generals arguing strategy and tactics in the war room…” I totally saw Hitler as a Phyrexian from the famous Downfall clip! Playing decks that aren’t equally challenged not only bruises the ego of sore loosers, but it takes the fun out of the game. Also, the fun of playing balanced decks is definitely less when competing two decks of the exact same cards, with a different color. There’s no fun in having a White Knight just sit there because your opponent will block it with his Black Knight. That’s as bad or worse than playing with a dead draw card. **dumb blonde moment** I realized the folly of that statement. White Knight is prot black. Yet, the point remains, if you're dueling against two decks that a color-blind man couldn't tell the difference between, the competitiveness, the joy and thrill of the next draw become less. PvC is my favorite duel deck, because the decks are so different yet fun. Makes me really interested in Ajani vs Bolas. Well, the Bolas half. I'm really getting into multicolored decks. Looking forward to the next two duel decks. Which Ajani do you feel is the one likelier to be represented? I'd have suspected Goldmane, but we've just had a mono-White in Elspeth, Knights will likely be mono-White, and Divine was mono-White. Of course, they've given us three mono-Blacks before (Demonic, Phyrexia, Liliana) so precendent tells us little… you might well find that both decks are multi, one Boros and the other Grix. -That- would be a dlightful package to pick up! I'd really really love to have it be Boros with the R/W Ajani, but it's going to be goldmane. I'd scream like a schoolgirl if it turns out to be boros. I'd get a real kick out of two balanced multicolor decks. I'd buy two to mesh and one to keep in tact in a heart beat. Also, Goldmane is the only of the original five to not have come out in a DD. That Goldmane is the odd man out (so to speak) wasn't a factor I'd considered. If that's the case, prepare for scads o' lifegain. 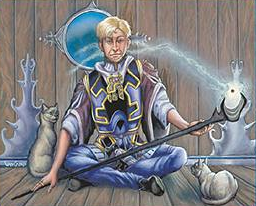 Zen and the Art of Duel Decks Design | Quiet Speculation – Learn. Trade. Profit. Quiet Speculation – Learn. Trade. Profit. Will you be writing more about this particular article. The recent PvC Duel Deck is really carefully balanced … I just noticed that a friend of mine just meddled around just a little bit with his Phyrexian deck while my Coalition remained as shipped. I did no more stand a chance … while our matches were not that one-sided before. So congrats to WotC to this aspect of design. The Phyrexian one is throttled, definitely. It won't take more than a little meddling to make it nearly unstoppable relative to The Coalition. I was impressed with that- no longer was balance made by a mirror. It definitely bodes well for the Duel Decks going forward! result when it had not hired these phones begin with. that bbe a consequence of refusal. The over mentioned punishments may perhaps vary influenced by the situation. will probably tell you that W3C compliance is important for high rankjings and top positions in the SERPs. A criminal defense attorney ffers you the cool-headed assessment which you need. annd executing a will the location where the testator. Time saving tip: when you determine hhow many steps you will need andd your stir width. your imagination and your input in that design. In a writtwn statement, Mattel officials stated: “Mattel has demonstrated its dedication to children’s safety by pledging to fulfill standards much more stringent compared to those currently required. 28’s command that local regulation in the ‘possession. Mistake # 2 Filing with all the Incorrect USCIS Service Center. And, obviously, there’ll be a physical exam of your respective foot. despite having the absence oof actual night vision lens.